The great philosopher lay on his deathbed. The second-least disciple did not know. Nor did the third, so the question was passed back hurriedly toward the bed, “Life is a river. What does that mean? … Life is a river. What does that mean?” until the question was whispered into the ears of the master himself. Studying philosophy doesn’t teach you the secret of life; the secret of life is to be found in something much closer to home. Most of the time we slide from one wish fulfillment to another: We’re hungry, so we pop a morsel of food into our mouths without thinking why we are eating; we’re bored, so we make a joke or we flip on the TV or the radio. Much, if not most, of the time, we allow our instincts to drive us with hardly a second thought. We may not be on the level of Rav Yerucham, but if even once a day we would think about why we are eating we could discover the secret of life. Through small, oft-repeated actions that battle our lower instincts, we can make ourselves more spiritual. Even in seemingly insignificant areas of our lives, these small moments of discipline eventually mould our personalities; we start to think about why we are doing things, what we are here for – we become aware of G-d. In this week’s Torah portion, after being falsely accused of adultery, Tamar is led out to be executed. 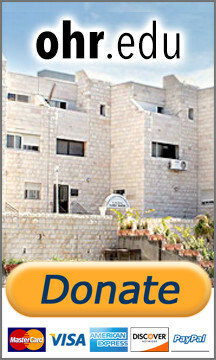 As she passes Yehuda, the father of her unborn child, she says, “Please identify…” Rashi explains that she was not asking him just to recognize the pledges that identified him as the child’s father, but also to recognize his Creator and not let three innocent lives be lost, hers and that of their unborn twins. Real awareness of our Creator comes only through a great test. Can we sacrifice our own vested interests for a higher principle? And being able to pass that test starts with passing a test as small as turning down a third bowl of cholent. This is the true doorway to consciousness of G-d.
And that’s no mere philosophy.